Everybody is coloring these days as a way to relax and play with colors. 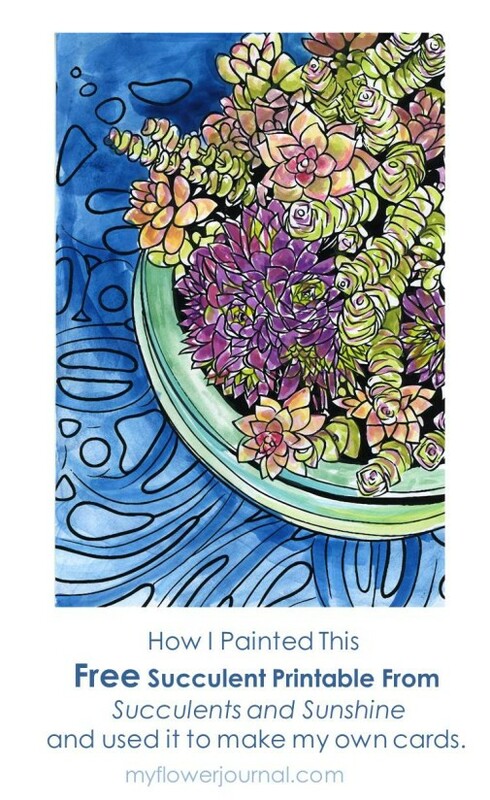 On my daughter”s web site, Succulents and Sunshine, she has a free succulent printable that you can download, print, color and use for framed art, cards or postcards. 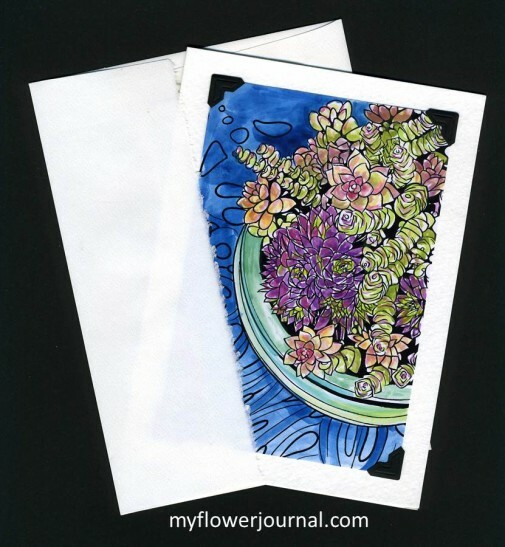 Download the Free Succulent Printable here. Print it on 4×6 paper of your choice. I used this photo paper and printed mine on this printer. I used the Koi Watercolor Set with 24 colors to paint mine. (Now I have a new Koi set with 30 colors. Read more about it here.) When using watercolor leave some white space for highlights. Remember watercolor dries lighter so keep your colors intense. Have a scrap of white paper nearby where you can test your colors and get them just right before you paint them on your card. Have fun mixing and trying new colors. You can use your imagination. Your succulents don’t have to look exactly like the ones you would buy at a nursery. Some succulents change colors depending on the season and weather. Be creative! When my succulent printable was dry I placed it on my ironing board, paint side down. Next I placed a piece of white copy paper on it then used a warm iron to flatten and smooth it. The photo paper I used took the water fairly well, but wrinkled a little bit as it dried. You may want to print yours on Mixed Media Paper then trim it to size. My printer wouldn’t print on watercolor postcards. I love working on the small 4×6 size. The small size makes it a quick and portable project. The finished piece can be framed in a standard 4×6 frame or used as a card or postcard.